I have come to respect the work of Danielle DiMartino Booth, who pens “The Daily Feather.” She does what most writers can’t do and that is make reading about economic statistics entertaining. But more importantly, she is a sharp objective observer of economic trends. For example, on April 5, she pointed out how, despite Republicans boasting very low initial jobless claims and how strong the economy is, based on hard data from the ADP, small business private payroll in both manufacturing and construction were down and that ADP reported that “the job market is weakening, with employment gains slowing significantly across most industries and company sizes.” Then Challenger, Gray & Christmas reported that job cuts during the first quarter of this year were up 10.3% over the last three months and 35.6% com­pared to the same quarter last year. 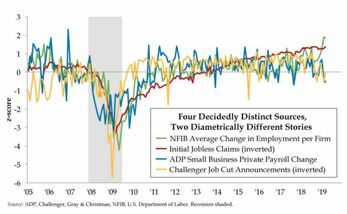 Danielle pointed out an additional fact of greater concern and that is the only time over the past 15 years that we have seen such a wide dispersion between the NFIB Average (which is based not on hard data but on perception) compared to ADP small business payroll declines was in the April-May 2008 period. On April 1, Danielle pointed out that auto industry inventories are building dramatically, which is one reason manufacturing has appeared as good as it has over the past couple of months. But with this inventory build, 6 of 10 auto producing states (Michigan, Indiana, Ohio, Tennessee, Kentucky, and Alabama) are already laying off workers. The risk we face now is that the final four states—Texas, California, South Carolina, and Missouri will follow suit. When I had Danielle on my radio show on March 12, she opined that she thought the chances of the U.S. entering a recession this year were extremely high. Wall Street and mainstream media pay very close attention to rising stock prices that suggest all is well. If you judge the real economy by Wall Street you would be deceived. Danielle pointed out on April 3 that in the tenth year of a recovery, which is where we are now, stocks have gained 18% despite the fact that economic growth is running at 32% below average at this stage. Something tells me the bond market, which has been on the rise, has it right, while the equity market is wrong on the direction of the economy. We may have a rude awakening ahead of us yet this year. What can the Fed and other central banks do but debase fiat currency, which means gold is likely to rise, showing the level of currency depreciation. At some point, when there is no more joy in buying the stock market, I feel confident our day in the very tiny junior gold share market will come.